We are so glad to announce that Kyabje Dhakpa Tritul Rinpoche has kindly accepted our request to give some of the very rare teachings. The dates have been set on 13th to the 23rd of December at Sera Mey Monastery, Mysore, Karnataka, South India. Further more , the Sera Mey Monastery has been so kind to us to find this time for these following teachings in one of their most busy months of the year. Teachings are set Teachings of Youthok Nyingthig (there are over 53 sections) it includes the empowerments and oral transmissions, also empowerment of Yellow Vajra Bhairava (the wrathful Manifestation of Manjushri) and Word Discourse of White Tara and so on. In 1962 His Holiness the 14th Dalai Lama appointed Venerable Dhakpa Rinpoche as the Abbot of Sera Mey Monastery, the first Abbot of the Sera Mey Monastery in exile. Rinpoche took his place as an abbot for three years but due to his poor health he had to leave the Monastery and went to north eastern India for medical treatment in Kalimpong. During his stay in Kalimpong many local Tibetans made strong connections with Rinpoche through his spiritual teachings and blessings. 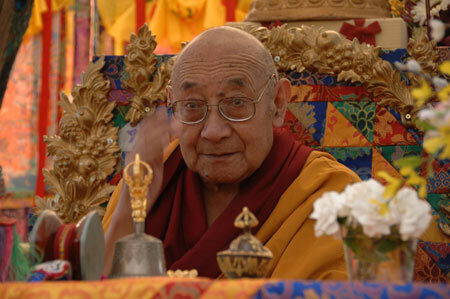 Until 1990 Rinpoche led a very quiet life in Kalimpong and spent much of his time in retreat and meditation. Although Rinpoche is one of the most precious and valuable spiritual teachers living in India, due to his humble nature and personal practices, he was little known outside his area. However, he is in fact one of the very rare teachers holding teachings from the most valuable and precious secret lineages which he received from Pabongka Rinpoche and many other highly realized reincarnated Lamas in Tibet. Throughout his life Rinpoche has actively sought out teachings from spiritual masters from other Tibetan Buddhist traditions which adds to the richness of his understanding and teachings. It is now time for him to pass on all these secret lineages to the young Lamas and Geshes before he gets too old. Therefore, Rinpoche was requested to pass on all those teachings and other Tantric initiations to the young Rinpoches at Sera Mey Monastery, which he does for three months every winter. His Holiness the Dalai Lama has praised Dhakpa Rinpoche for his dedication to his practices and the generosity of his teachings.